Boston is relatively small and easy to get around, and one of my favorite ways to explore the city is by bicycle. Even if you don’t have a bike, The Blue Bikes (formerly known as Hubway) bikeshare program lets you rent a bike and is a great way to experience the city and all it has to offer. 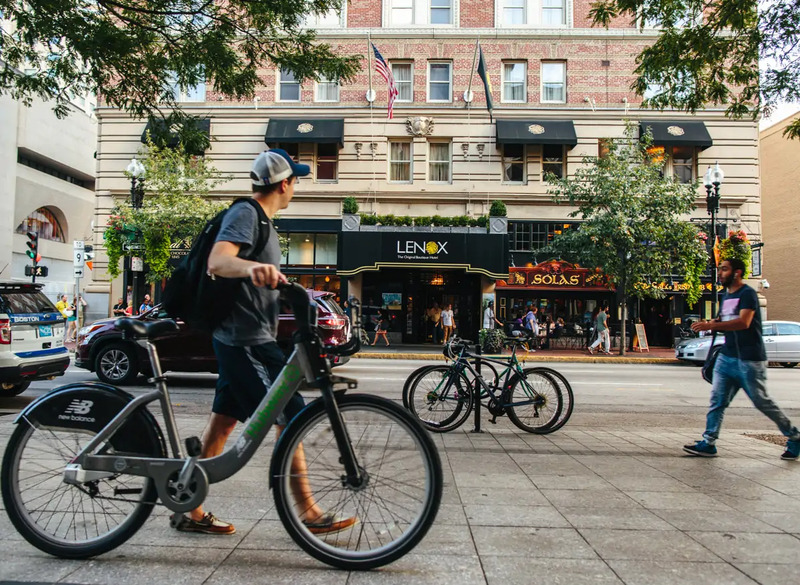 With inexpensive rentals and bike stations located all over the city, you can start and stop basically anywhere. Here is a bike route you can follow with some of my favorite sights, especially for biking! Before you go, don’t forget to borrow one of our complimentary Bern helmets from the front desk…safety first! The closest Blue Bikes station to The Lenox is just a block away in Copley Square, on Dartmouth Street outside the Boston Public Library. From there, you can head North on Dartmouth Street until you hit Storrow Drive, the main road that borders the southern side of the Charles River. Cross Storrow Drive using the footbridge, and you can bike up and down the Esplanade, a paved biking and running trail right along the river. You’ll see plenty of people walking their dogs, children on the playground, and Duckboats on the Charles. You can end your ride along the river by heading east on the bike path towards the Hatch Shell. Cross another footbridge back over Storrow Drive and lock up your bike at the Blue Bikes station at the crossroads Beacon Street and Arlington Street. Conveniently, this station is across the street from the Boston Public Garden, another one of my favorite spots to enjoy when the weather is nice. Here you can meander through the beautiful botanical garden as you stretch your legs and take a break from the bike. You’ll see Boston’s famous swan boats, a set of duck statues dedicated to Make Way for Ducklings, and plenty of squirrels burying acorns for the winter. Make your way through the Public Garden to the corner of Boylston and Arlington streets, where you can pick up another bike. Next stop: the Rose Fitzgerald Kennedy Greenway, just a 5 minute ride down Boylston. During the summer this once-freeway-turned-open-space hosts various activities like movie nights, yoga, beer garden popups, food trucks, and public art. Lock up your bike here and check out what’s going on at the Greenway today!